Nagpur: When it comes to spitting at public places and spoiling the atmosphere, nobody competes with Indians. And the main culprits for creating this dirty, nauseatic sight are the diehard addicts of kharra, tobacco, paan. At a time when Swachh Bharat Abhiyan is being implemented in letter and spirit, the number of ‘pichkarians’ (spitters) has not shown a decline. “Spitting at public places is our birth right” is the mentality of many. Spitting in public is as bad as vandalism. Spitting in public places is unpleasant, unacceptable and antisocial. It is a filthy habit that can spread germs and cause health issues. The spit carries bacteria, which once in public can harm each one of us. Moreover, spitting can cause extensive damage to public property and hence it can be considered a deliberate action to damage public or private property. But the dirty picture may change, hopefully. In view of the bad habits of people, a brother-sister duo from Nagpur has come out with a scientific solution. The siblings have invented pocket-sized ‘Eco-Friendly Spittoon’ for the convenience of those who ‘enjoy’ spitting at public places. The inventors are Ritu and Pratik Malhotra. With their unique invention, the youngsters have become an ideal for many. Concerned over habit of spitting at each and every public place and the damage it is causing to ecology, the Malhotra siblings pondered hard over the solution. Since both have completed engineering, they tried to come out with a creation based on technology and research. And the creation was before the world in the form of “Easyspit,” an eco-friendly spittoon made up of specific material. The “Easyspit” can be placed in pockets easily. What the spitters will have to do is to take it out from pocket and use it for spitting. No need to work hard. Since specially made ‘absorb’ material is being used for ‘Easyspit,’ the spit is absorbed and later turned into crystals. Hence there is no possibility of pocket getting wet and emission of stench. The “Easyspit” can be used for spitting 25 times and can be easily disposed of. The sister-brother duo Ritu and Pratik Malhotra have also created ‘spittoon’ in the form of ‘Packet’ and ‘Container’ to be used in a car. When the spit falls on ground, its temperature increases. This leads to spread of germs and cause health issues. But the absorbent material used in ‘Easyspit’ averts rise in temperature and destroys germs. Since the ‘Packet’ is zipped, the spit does not come out. The “packet’ will also be prepared from paper on the lines of ‘Container,’ said the Malhotras. The Malhotra sister and brother said they have applied for ‘patent.’ “The bad habit of spitting at public places made us uneasy. 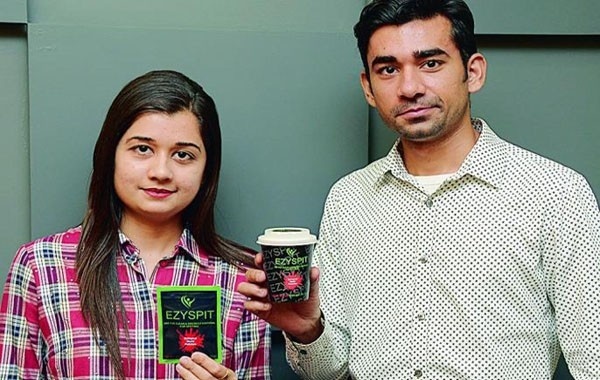 Out of this uneasiness, we invented the ‘Easyspit’ at a time when Swachh Bharat Abhiyan is being implemented with zeal,” opined Ritu and Pratik Malhotra.